Lake Sakura (さくら湖) is an artificial lake formed by Miharu Dam which located in Fukushima Prefecture. Because there are many beautiful Sakura, cherry blossom, including Takizakura which chosen as the best Sakura in Japan around this lake, this lake is called Lake Sakura. There are many view points in this lake. The Dam took the design of Japanese castle because Miharu was castle town. It is looks like Ishigaki of Japanese castle. 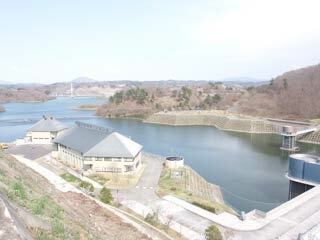 There is a museum of Miharu Dam next to the dam.